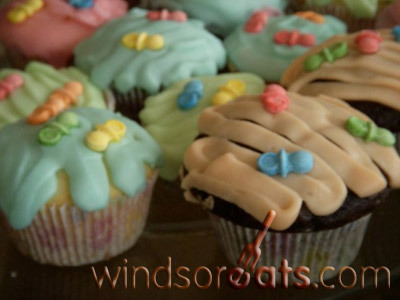 After a successful “sweet” competition in 2012, Battle Cupcake in Kingsville is back! Battle Cupcake 2013 will see several establishments competing to see who will be crowned ‘King’ or ‘Queen’ of the cup cake. Participating establishments include: Jack’s GastroPub, The Main Grill & Ale House, Mettawas Station, Pelee Island Winery, Aleksander Estate Winery and others. Guests are welcome to visit any of the establishments from February 11 to 17, 2013 to judge for themselves, as the featured cakes will be offered up for a week-long celebration of Valentine’s Day. A ‘Cupcake Passport’ will be offered to all who taste. If you have successfully scrutinized any 3 of the participating cupcakes your passport will be entered into a draw to take place at the judging on February 17 for a chance to win $225 worth of wining and dining in Kingsville. WindsorEats’ Adriano Ciotoli, will be a guest “taster” on Sunday, February 17, 3pm at The Carnegie Arts & Visitors Centre. Adriano and a panel of celebrity ‘ Tasters’ will choose a champion for 2013. Everyone is welcome!